First time to SF for our little ones ages 4 and 6 and they both loved this. The best part was riding across the Golden Gate Bridge. Definitely recommend this to families with kids of all ages. My Mum and I went on this trip yesterday and could not have asked for a better experience. The fire engine was a unique way to see the city, and we loved that Deborah included some history and facts about SF fire fighters. Thanks to Deborah and Johnny for an amazing intro to SF. It was amazing! 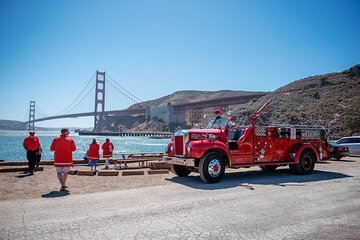 The ride across the Golden Gate Bridge in a classic fire truck was exhilarating! Truly a fun, wonderful experience. So much fun! Loved that it was a small group. Truck ride is bumpy and windy, but still lots of fun! Best way to get over the bridge. Also stop at a great spot to take pictures and see a seal or two. Driver and guide were great! As two early retirees, we found it a little hocky, but it was great for young kids. The driver was fine. The tour guide was a warm woman who sang professionally. She was good and belted out tunes throughout the tour. It made for a fun afternoon. As well, she was quite informative and chatty. She made sure that we had plenty of good photo ops...she even took about a dozen pics of each group. FYI, prepare for it to be chilly. We had sweatshirts and jackets on and were quite chilly as we went over the bridge. Fortunately, there were clean fireman coats available.